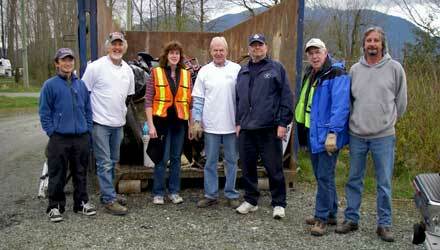 Thanks for visiting the official website of the Chilliwack Vedder River Cleanup Society. The CVRCS is a not-for-profit society formed in 2002 by a group of dedicated people who regularly use the Chilliwack/Vedder River for recreation. Our goal, simply put, is to keep this magnificent river valley clean so we can all fully enjoy its beauty, and so it can be appreciated for generations to come. We would like to acknowledge that we are working on the Traditional Territory of Ts'elxwéyeqw Tribe. The Ts’elxwéyeqw Tribe communities are: Aitchelitz; Skowkale; Shxwhá:y; Soowahlie; Squiala; Tzeachten and Yakweakwioose. On this website we'll try to keep you informed about our up-coming cleanup events, the Adopt-a-River program, Hot Spot clean-ups, and any other information or changes that might become relevant to the health of the watershed. If you are a regular user of the Chilliwack/Vedder River system, we invite you to participate in our cleanup events, or get involved by adopting a section of the river. Your support directly benefits the river, and it feels great to get involved in your community and to make a difference. The Hot Spot Cleanup Squad is a group of volunteers who help clean up the river valley outside the scope of our regularly scheduled cleanup events. In coordination with the Fraser Riverkeepers, we respond to notification of illegal dumping spots, and we coordinate the pickup of that garbage and its proper disposal. The Hot Spot Cleanup Squad is not responsible for doing the cleanup itself, the individual or group that reports the illegal dumping spot agrees to gather the garbage and the Hot Spot Cleanup Squad agrees to collect it. 4. be careful as some material may be hazardous. Please bring your own travel mug if you want a hot morning coffee from Tim Horton's (we will no longer be supplying single-use cups). Bring a water bottle too, and get a fill-up from the Chilliwack Water Store to keep you hydrated for the rest of the morning. Remote registration will be set up at Thompson Regional Park at 48562 Chilliwack Lake Road for those volunteers who live in the Chilliwack River Valley. Bring a travel mug/water bottle. We want to eliminate single use cups at our cleanup events! Registration starts at 8:30am, and the clean up runs until around noon. Then we'll host a volunteer appreciation BBQ and Prize Raffle. Come check out the displays and information about what other groups are doing in our community, as we welcome back our friends at Fraser Riverkeeper, Waterwealth Project, Freshwater Fisheries Society of BC, and more. We extend a huge thank you to the Adopt-A-River Program participants and groups who are out there making a difference throughout the year. We could not do what we do without you! Thanks to Tim Hortons and the Chilliwack Water Store for providing refreshments. Many local businesses generously support our BC Rivers Day Celebration with prizes for the volunteer raffle. In addition, the amazing folks at the Chilliwack Water Store and Tim Horton's (Industrial Way, Chilliwack) have supplied water, hot coffee and baked goods for cleanup participants. Thanks for your support.